Philadelphia's Cameron Clarke earned a perfect SAT score this year. We have the distinct pleasure of watching more and more of our children become academic superstars daily. The latest academic feat will is the most wonderful Christmas present parents could receive from their child. Cameron Clarke is an African-American high school senior at Philadelphia’s Germantown Academy Upper School that he’s attended since pre-K. This Christmas he, and his parents, are celebrating the news of a perfect score on his SAT, according to the Root and Fox 29 Philly. “I woke up and checked my score on my cell phone and I didn’t believe it at first, so I kept refreshing the page and after five to 10 times refreshing I woke my parents up. ‘Mom, dad I got a perfect score!’ ” Cameron Clarke told FOX 29. Check out the report on this stellar student. Congratulations Clarke family! In his second book for adults, the perennial New York Times bestselling author helps readers discover how to put money in its place and use wealth-building as a tool for joy and fulfillment. Hill Harper is uniquely poised to guide readers through tough times and offers bestselling advice for reaping the rewards of a truly happy life. With The Wealth Cure, he does more than that: He presents a revolutionary new definition of wealth; motivating readers to not only build financial security but to achieve wealth in every aspect of their lives. Applying a parable approach, Harper instills practical nuts-and-bolts explanations for laying a sound financial foundation and also focuses on how to recognize the worth of your relationships and increase the value of your interactions with the people in your life. Drawing on personal recollections and true stories from family and friends, Harper has created an inspiring guide. Readers will begin to see money as energy and a freedom for following their passions. Far from a get-rich-quick primer, The Wealth Cure brims with inspired wisdom for building a lasting bounty from the experiences, loved ones, and achievements that really matter. Conscious TV - This man will INSPIRE you TODAY! 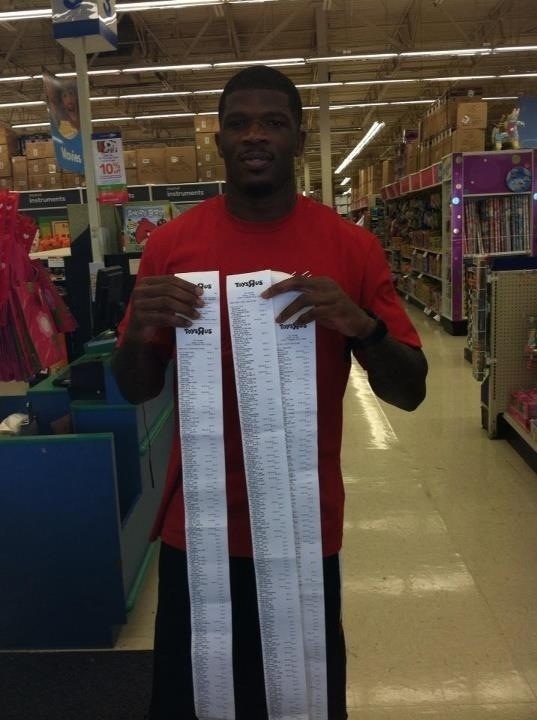 Andre Johnson of the Houston Texans is scoring a lot of points today -- for kids. The NFL wide receiver brought 12 children chosen by Child Protective Services to a Houston Toys "R" Us for a holiday shopping spree. He gave them 80 seconds to fill their baskets with anything from Barbie dream houses to digital cameras, and by the end Johnson’s foundation footed a $19,521 bill, he told houstontexans.com. An image of Johnson holding three lengthy store receipts in the store surfaced on Reddit and has accumulated more than 1,450 comments as of press time. "Every day when I wake up, I ask myself, 'Who can I add value to today,' because it's not about me. It's all about helping someone else. And at this time of the year there are many opportunities to help less fortunate children have a great Christmas," Johnson told ABC13.com. The children, ages eight to 16, have been exposed to some form of parental abuse and now live with their extended families, according to houstontexans.com. Johnson can relate to a difficult home life. “A lot of these kids get discouraged because of where they grew up and things like that. I grew up in a single-parent home and I was fortunate to achieve my goals,” he told houstontexans.com. Afterward the shopping spree Johnson had one more stop to make. After picking up the five-figure bill, Johnson helped the Houston Police Department surprise 800 Bastian Elementary School students with Christmas toys, ABC13.com reports. The pro-bowler’s foundation partnered with the police department’s Blue Santa program to raise awareness for underprivileged children, according to the news outlet. Founded in 2003, the Andre Johnson Charitable Foundation is dedicated to empowering children from single-parent homes. The foundation hosts several children’s charity events in Houston and Miami throughout the year but the Christmas shopping spree is one of his favorites, he told houstontexans.com. “That’s what this season is about. It’s something I look forward to. The kids are happy, they get what they want for Christmas, and that’s all that matters, “ he told the news outlet. The Best Les Brown You Ever Heard!! !